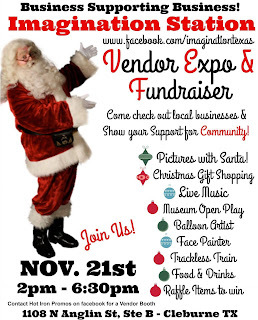 "Join us for Food, Live Music, Shopping, Raffle Prizes, Pictures with Santa, and lots of FUN! The museum is offering OPEN play time for you to bring the kiddos and come check out the NEW location in Cleburne! We are raising money to help Imagination Station grow and Expand, to give the children of Johnson County an experience like none other in the area! We are hoping to help them soften the blows associated with having to close one location and move to another, and all that comea with building their following in a new area..... GOAL: That they would no longer be A BEST KEPT SECRET! Will you help us? Will you invite your friends, neighbors, your daycare, school, church and help us get the word out? Have you been to the NEW location of Imagination Station Children's Museum? Come see what's new! Check out the Lowe's room and more! Imagination Station is a HANDS ON children's museum, where a child can create, explore, paint, build, slide and so much more! They even do Birthday parties! We are thankful for all the small businesses coming together to support this cause. As always though... WE BRING THE FUN! 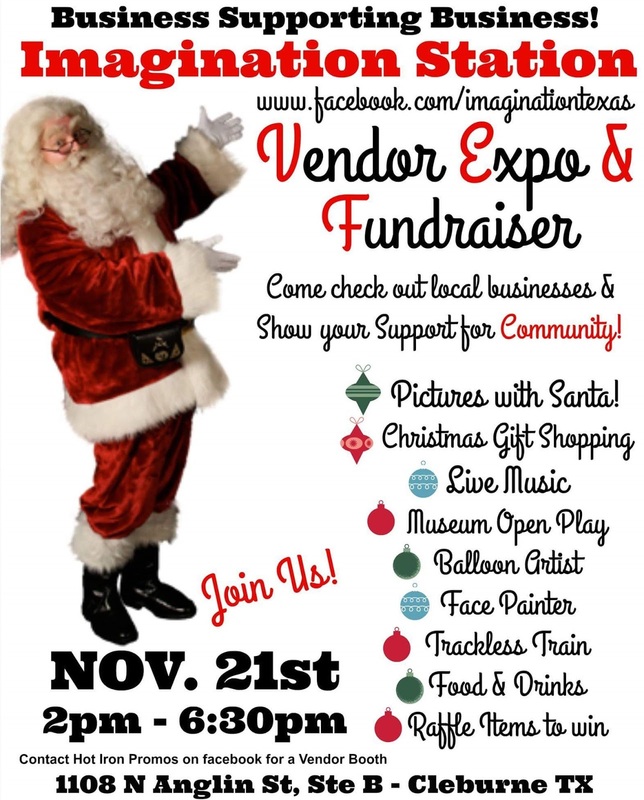 So come out and have fun with the family, listen to some great local music, and do some pre-Christmas shopping... you will be helping community and have a blast doing it!" Outdoor (10 X 10) - $35. Canopy needed. Applications are available here and are due by November 14, 2015.